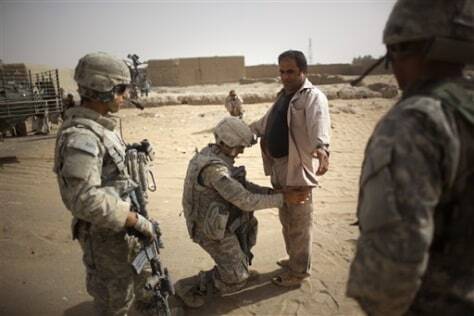 An Afghan man is searched by U.S. soldiers from the 5th. Striker Brigades in a village in the outskirts of Spin Boldak, about 100 kilometers southeast of Kandahar, Afghanistan, Thursday. Thousands of U.S. troops are deploying in southern Afghanistan as part of an effort to prevent the Taliban from disrupting the country's Aug. 20 presidential ballot.